In 2020, NASA's next rover will launch from Cape Canaveral Air Force Station in Florida and head to the Jezero Crater on Mars. Jezero was once home to an ancient lake-delta system that scientists believe may have captured and preserved information on the Red Planet's evolution—and, if it ever existed there, evidence of ancient life. One of those scientists was Tanja Bosak, an associate professor in MIT's Department of Earth, Atmospheric and Planetary Sciences (EAPS). Her work uses experimental geobiology to explore modern biogeochemical and sedimentological processes in microbial systems. For Bosak, Jezero Crater is the ideal landing site for learning about the potential habitability of early Mars. "Jezero Crater's geology is very obvious [from orbit], and it is clear that the environment was habitable in the past," Bosak says. "It is older than any sedimentary environment preserved in the rock record from Earth. Jezero Crater preserves some of the most ideal rock types that we use to look for past life on Earth." Within these rocks are clays and carbonates—minerals known to facilitate the preservation of fossils on Earth. Bosak's work as an investigator in the Simons Collaboration on the Origins of Life (SCOL) contributed to a talk at the October workshop titled, "A Search for Prebiotic Signatures with the Mars 2020 Rover," given by David Catling. Catling is a professor in Earth and Space Sciences at the University of Washington and is also a SCOL investigator. In his talk, Catling argued that even if life never emerged on Mars in the first place, scientists could focus on whether prebiotic precursors were ever present in the Martian environment—information that is important for discerning the conditions necessary for life to occur. Roger Summons, the Schlumberger Professor of Geobiology in EAPS and SCOL investigator, also contributed to the presentation. As principal investigator of the MIT NASA Astrobiology Institute team Foundations of Complex Life, and as a member of the Sample Analysis on Mars instrument team using NASA's Curiosity rover, Summons' work focuses on the preservation of organic matter from different environments on Earth and Mars. "We know from our efforts to find traces of the earliest life on the Earth that the best chance for finding convincing and credible evidence will come from studies of well-preserved, fine-grained layered rocks that were deposited under bodies of standing water," Summons says. Earlier in the year, both Bosak and Summons contributed to "A Field Guide to Finding Fossils on Mars," a review article published in the Journal of Geophysical Research that summarized the strategies behind the search for ancient biosignatures among the different potentially habitable Martian environments. The authors of the review mentioned the favorability of sedimentary environments much like those found at Jezero Crater, because analogs to those environments on Earth, like river deltas and lakes, have the highest potential to collect and preserve both molecular fossils and body fossils of microbes. In fact, organic matter was recently detected in 3-billion-year-old mudstones at the site of an ancient lake at Gale Crater, the research site of the Mars Curiosity Rover. The findings, published in Science, fueled heightened interests in potential organic matter preservation at other landing sites on Mars—including Jezero Crater. This is because the Mars 2020 mission, unlike previous missions to Mars, will not only perform measurements in the Martian environment, but will also collect and cache sediment cores from sites of interest to be returned to Earth during a later mission. "While much can be learned from using the imaging and spectroscopic tools that can be operated remotely on spacecraft, nothing compares to the sensitivity and specificity with the rapidly advancing chemical instrumentation we can access in laboratories around the world," Summons says. "This has been shown over and over again by what has been learned during the almost fifty years of studies of rocks that were returned to Earth during the Apollo era of moon exploration." Bosak is most excited about the images and data the rover will collect during its mission to Jezero Crater. The mission could shed light on whether carbonates present on the rim of the crater "precipitated out of the lake, just like limestones do." On Earth, "limestones from the early Earth can have shapes that record microbial interactions with sediments and microbially-stimulated precipitation of minerals," Bosak says. Ben Weiss, professor of planetary sciences in EAPS, also attended the Mars 2020 Landing Site Workshop and presented with co-author Anna Mittelholz, a graduate student at the University of British Columbia, on potential studies of Mars' magnetic field. "Jezero will also be an extremely exciting place to obtain samples for understanding the history of the ancient Martian magnetic field," Weiss says. In the summer, Mittelholz and Weiss published a paper in the journal Earth and Space Science, "The Mars 2020 Candidate Landing Sites: A Magnetic Field Perspective," which details the findings they presented at the workshop. Sometime during the Martian planetary evolution, Mars lost its global magnetic field and much of its early atmosphere, which could have drastically altered the Martian environment. Planetary magnetic fields are generated by the movement of metallic fluids deep in planetary interiors in a process known as the dynamo. For example, Earth's magnetic field is generated and sustained from its molten, iron-rich core. "The most important issue is to determine when the [Martian] dynamo turned off. This would help determine if the transition from a warmer, wetter early Mars to the current cold and dry state was caused by the loss of the dynamo field," Weiss says. "Jezero is an excellent place to test this hypothesis because it contains rocks and minerals with ages spanning the time we suspect that the dynamo turned off." 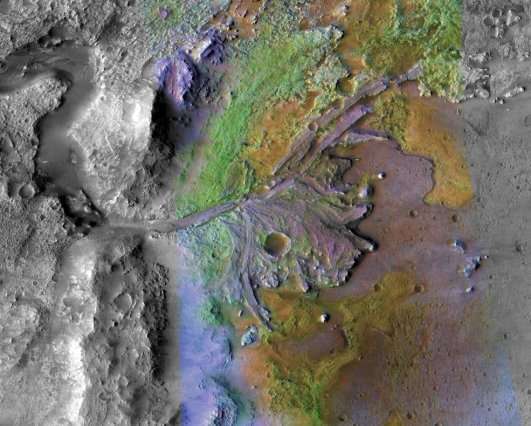 "Jezero Crater will make a great place for understanding the contribution of the dynamo to protecting the early atmosphere, and the habitability of early Mars," Weiss says. "I think that this is as good as it gets," Bosak says.